To be totally honest, Coral Bay Fishing has to be one of the best in Western Australia. Sure, you can go to Steep Point and other more remote locations, but for a place that has shops, houses and a boat ramp, Coral Bay has some truly incredible fishing. I often talk to people in Perth who say they don’t bother fishing around Perth anymore because of how spoilt they are when they visit places like Coral Bay. It really becomes a totally different ball game, because of the huge number of fish available to catch, whether it’s off the rocks, beach or boat. For more general information on this great spot, click on Coral Bay. If you love fishing then I would recommend getting an Ice Chest before going to Coral Bay; its a great way to keep your catch fresh. Spear fishing at Coral Bay is a huge amount of fun too. I often found myself switching aim to different fish that I wanted to shoot because another nice one would swim by, and then another and another! 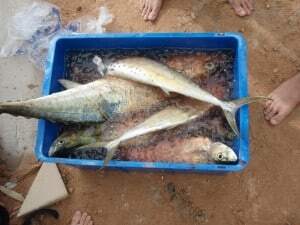 We managed to shoot and catch a huge amount of fish in a 2 week period staying at Coral Bay, and we froze the fillets and took them home. They have provided our family with over 6 months of beautiful fish; you can’t complain about that! Coral Bay Fishing simply put takes it to another level. I always find the worst thing about fishing is the waiting game. If you go on a charter boat, I can guarantee that there won’t be much waiting. To be honest, there is fish anywhere you choose to go! Of course, you need to be careful that you are allowed to fish in the area, as there are a number of protected areas and they are not all the same type. Some areas you are allowed to fish in, but not spearfish and many areas you can do both. The bay itself is completely banned for fishing, and the fines are heavy if you get caught breaking the rules. The areas are all well marked, and you can visit the volunteer calm officer near the fish cleaning station most days in the stated hours that they are there to double check. They also have a huge number of pamphlets that they give out which show you in detail where you can go. If you don’t have a boat, then fishing anywhere up and down off the rocks and beaches works quite well. You are allowed to fish off the rocks near the jetty, and some decent sized fish are taken here quite regularly, but you need to be a bit patient at times. A number of fish come in to feed off the bottom of all the moored boats, and you will get a few whoppers every now and again. 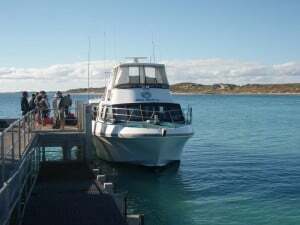 Maud’s Landing (just north of Coral Bay) is a great place to catch tailor, snapper, mulloway, trevally, mackerel, tuna, bone fish, salmon trout, sharks and the odd reef fish, especially on sundown. This has to be one of my favourite Coral Bay Fishing locations. You can drive along the main track with a two wheel drive vehicle if you want (just take it slowly) and park then walk onto the beach. Alternatively, if you have a 4×4 then you can drive onto the beach and north until you find a good fishing spot. You can also drive south a little bit, until the marine park starts (marked by huge yellow markers). 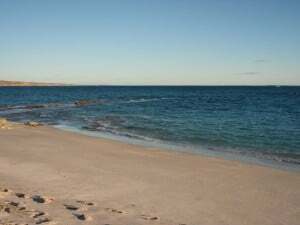 5 Finger Reef is just south of the boat ramp, through a 4×4 track and onto the beach. The track starts at the top of the hill where the boat ramp is. 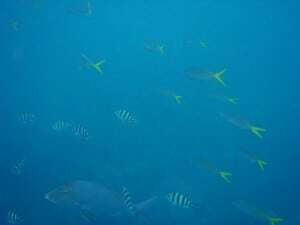 The area is basically 5 bits of reef that run out about 25 metres each with some nice coral and plenty of fish. Some years this gets rather fished out, but there is usually something nice swimming around. We did quite well spear fishing there and it’s not too deep. If you are confident, you can swim out a long way. The reef continues a long way out, but be sure to tow a float and diving flag to let the boats know you are there. South of five finger reef proved good too, off the rocks. You just have to give it a bit of time off the shore; because it is the most accessible place it tends to get fished the most. Alternatively, go on a charter boat or hire a boat before you get to Coral Bay. You won’t regret doing that! If there is anything that you must do is to go on one of the Coral Bay Fishing Charters. We went on the Mahi Mahi II and had an absolute blast. There are several different charters, but the Mahi Mahi proves to be one of the more popular. You leave from town (a bus takes you to the charter boat) early in the morning and you are dropped back in town in the afternoon. From there, you go to the cleaning station and pick up your fish. 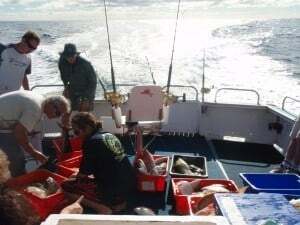 All the fish are filleted for you, and they will even freeze it in big freezers if you are staying for longer (you just pick it up when you leave Coral Bay). If the weather is no good then they will cancel and take you out on the next good day. Be sure to watch the weather before you book, particularly if you are leaving town in the coming days. 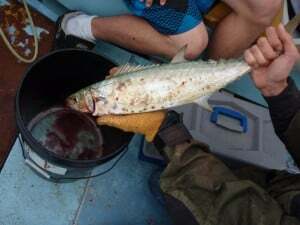 The charters are the best way to get a taste of Coral Bay Fishing. I was simply astounded at the number of fish everyone caught. The charter boats usually go out to about 100 metres of water, and they have all of the good fishing locations marked on a GPS. Trawling is usually done on the way out and the way back in. You are allowed to take your own rod, but if there are many people on the boat then you are best just to use the Aldi’s. These are almost like winches; you simply throw a heap of bait on, drop the line down to the bottom and wait a few seconds. You will feel the bites and you give the line an almighty tug. If it’s still tugging after then you have probably hooked the fish well. Wind it back in and you will have a good fish or maybe even two! You can either buy a shared line or have a line to yourself. I shared on the day that we went out, and we still had more than enough fishing each. If you go out with other people, you are given a special mark for the fish. This may be a cut on the tail of the fish or the head, and then they are split up according to the marks at the end. Any fish caught whilst trawling is split up amongst the entire boat load. Some of the fish that are often caught include Red Emperor, Perch, Mahi Mahi, and Wahoo, Mackerel, Sail Fish, Marlin, Spangled Emperor, Cods and more. Although it might seem expensive to go out on one of the charters, they are well worth it. You need to take your own lunch, and I would advise that taking some sea sickness tablets would be a good idea too! I would also advise a pair of gloves, as your hands get cut up towards the end of the day if you are fishing hard! The main area of the boat is shaded on the deck of the Mahi Mahi II which makes it comfortable throughout the day. There is a toilet and shower on board, as well as tea and coffee. The crew is great to chat to, although they are often kept busy by the huge number of fish that are being caught all day long. We saw a few dolphins and whales when we went out too, which was an added bonus. The best spear fishing I have done so far has been at Coral Bay. Due to the huge variety of fish that swim around, you can have a lot of fun. Being someone who didn’t know too many species of fish, it was a steep learning curve. I spent a lot of time looking through the guides to learn the different types of fish, because there are many that you are not allowed to shoot. We found as a general rule, if the tail of the fish was shaped in a sharp v then it was ok to shoot. To clarify: Head here and tail shaped like < that. 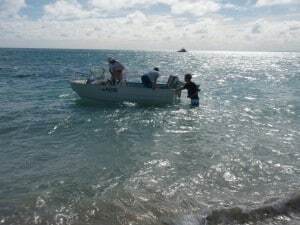 One of the best ways that we found to go spear fishing was to tie a rope to the bow and stern of the boat and then just drift over an area, and dive down when you saw anything. Be aware that the large majority of fish that you see near reef systems are not allowed to be shot; especially the ones that swim within a few metres of you! They have adapted knowing that you can’t shoot them! We managed to get some very nice sized snapper and spangled emperor, and had a lot of fun doing it. If you have a big enough boat and you are a confident diver then there are a number of huge fish along the main reef. Alternatively, we found the flats to be quite a good area to drift over. We managed (unintentionally) to attract a few sharks after shooting fish, but they seemed to leave you alone once they got anywhere near. 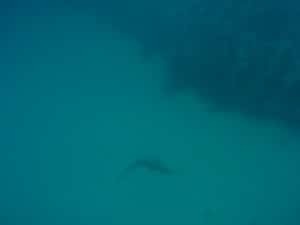 Most of the sharks at Coral Bay are less than 1.5 metres long, and are extremely frightened of humans. I did see a larger one come towards me just after I shot a fish, but it diverted and went away very quickly. The best thing to do is try and kill your fish in one shot, and get it out of the water as soon as possible (that’s obvious!). Don’t let the sharks deter you from having a go though, as they seem to be a lot more timid than the ones in Perth! For Spear fishing off the beach, the point just south of Maud’s Landing and 5 finger reef were good locations. Alternatively you can head further north on the 4×4 tracks and pick a calm spot. For those who are looking for some good photos or a great experience, head to the Shark cleaning station (on the inside of the reef with a big yellow mooring). I have never seen so many spangled emperor and GT’s in one location, not to mention some awesome coral and other species of fish! This is all part of the conservation zone, so you can’t shoot anything but it’s worth the dive anyway. 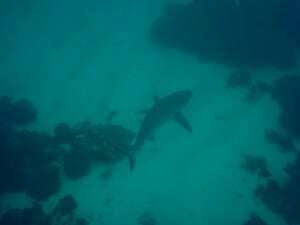 Sharks come here to clean, but they are mostly smaller reef ones so you are quite safe! In saying that, they are wild animals and you need to leave them alone. If you are lucky enough to have a boat at Coral Bay then your options are opened considerably. The boat ramp is only a few minutes from town and can comfortably launch a fairly large boat. You have two options to getting outside of the reef, if you choose to venture there. There is a north passage and south passage. The south passage is very dangerous in poor weather, and the north passage is shallower and takes longer to use. However, there have been some dodgy accidents in the south passage when the swell and waves are up. If it’s not good weather, give it a miss. We caught a heap of fish inside of the reef, but you just need to drift and pick the right place. The south passage usually has some good fish if you anchor there on a calm day and anywhere south of the boat ramp where there is reef will have good fish. Trawling on the inside and outside of the reef often gets some bigger mackerel as well, but be very careful of the waves! The most fun that we had with our little boat was just off Maud’s landing drifting early in the morning. We took out some light tackle and silver slices, and would motor around until you see the bait jumping. Just stop the motor and drift through the school and you are guaranteed to get some shark mackerel, GT’s and other fish. It is a lot of fun on light tackle too! 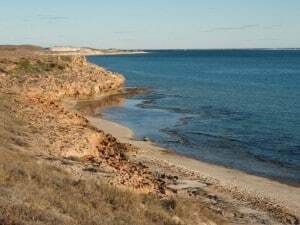 You can no longer hire a boat at Coral bay, but you can in Exmouth, Kalbarri and Perth. It’s well worth having a boat at Coral Bay, but you need to be comfortable driving one through reef and swell. I was surprised at the number of boats at Coral Bay, especially in peak season. I’d say I must have counted well over a hundred boats in only a small part of the town. I know several people who don’t even take bait for Coral Bay Fishing, but it’s up to you. Lures work exceptionally well (deep divers for trawling and slices are great) but you may not get much of a consistent result. Alternatively, bait will always bring the fish around and you aren’t so annoyed if you get bitten off! We must have lost at least 5 lures at Coral Bay, but it was worth it! We were told that when going for Mackerel a 2 – 3 metre wire leader is required, because the fish thrash around and cut normal line with their tails. This worked well, although we did still get the lines broken a few times. When big fish hit at Coral Bay, they hit hard! Take plenty of spares because you can go through it quickly! Bottom fishing proved to be the most successful for us, so plenty of sinkers are a good idea. We used a heap of overhead boat rods with cheap eBay braid and found they did well. Some of it isn’t the best quality, but you can get some incredible bargains. We paid about 10% of the price for our braid, and although it’s a bit thicker it’s still plenty good enough. I can say for sure that you will have a lot of fun doing Coral Bay Fishing. Sure, some days might not bring in anything but you have a much higher chance than anywhere in Perth! 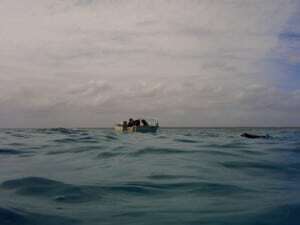 If you have a boat you are almost guaranteed fish, and as a minimum a great dive with the fish and coral. 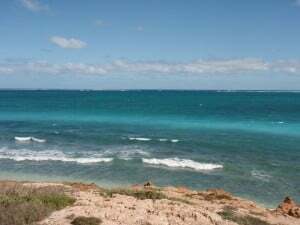 It is a long drive to Coral Bay, but it is worth every cent.